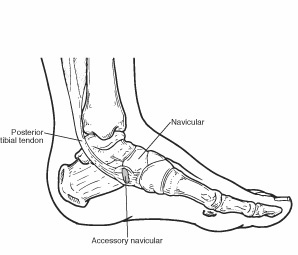 What is the Accessory Navicular? The accessory navicular (os navicularum or os tibiale externum) is an extra bone or piece of cartilage located on the inner side of the foot just above the arch. It is incorporated within the posterior tibial tendon, which attaches in this area. 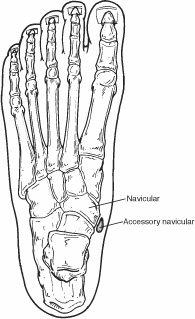 An accessory navicular is congenital (present at birth). It is not part of normal bone structure and therefore is not present in most people. What is Accessory Navicular Syndrome? Many people with accessory navicular syndrome also have flat feet (fallen arches). Having a flat foot puts more strain on the posterior tibial tendon, which can produce inflammation or irritation of the accessory navicular. To diagnose accessory navicular syndrome, the foot and ankle surgeon will ask about symptoms and examine the foot, looking for skin irritation or swelling. The doctor may press on the bony prominence to assess the area for discomfort. Foot structure, muscle strength, joint motion, and the way the patient walks may also be evaluated. X-rays are usually ordered to confirm the diagnosis. If there is ongoing pain or inflammation, an MRI or other advanced imaging tests may be used to further evaluate the condition. Immobilization. Placing the foot in a cast or removable walking boot allows the affected area to rest and decreases the inflammation. Ice. To reduce swelling, a bag of ice covered with a thin towel is applied to the affected area. Do not put ice directly on the skin. Medications. Oral nonsteroidal anti-inflammatory drugs (NSAIDs), such as ibuprofen, may be prescribed. In some cases, oral or injected steroid medications may be used in combination with immobilization to reduce pain and inflammation. Physical therapy. Physical therapy may be prescribed, including exercises and treatments to strengthen the muscles and decrease inflammation. The exercises may also help prevent recurrence of the symptoms. Orthotic devices. Custom orthotic devices that fit into the shoe provide support for the arch, and may play a role in preventing future symptoms. Even after successful treatment, the symptoms of accessory navicular syndrome sometimes reappear. When this happens, non-surgical approaches are usually repeated. If non-surgical treatment fails to relieve the symptoms of accessory navicular syndrome, surgery may be appropriate. Surgery may involve removing the accessory bone, reshaping the area, and repairing the posterior tibial tendon to improve its function. This extra bone is not needed for normal foot function.